We're thrilled to introduce one of our most powerful features yet: event filters. With event filters, you can slice and dice Radar event data to understand how users behave in the real world, create location-based audiences, and more. 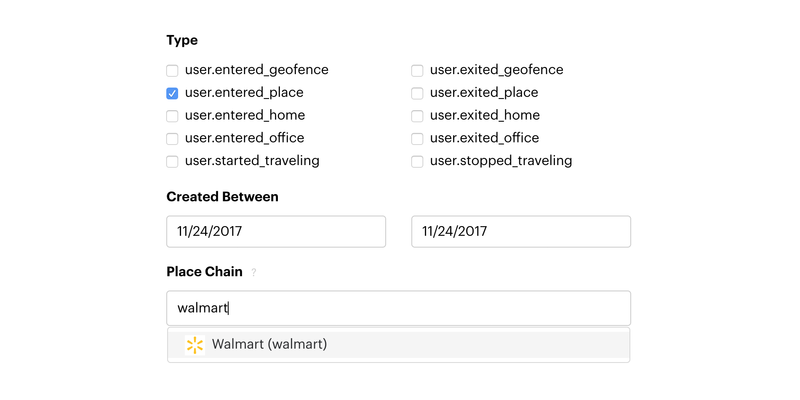 For example, you could filter on event type, date, and chain to create an audience of customers who visited Walmart on Black Friday, then export the list of user IDs to target a marketing campaign. Or, you could filter on event type and user ID to understand the real-world behavior of individual users. We plan to introduce more tools to analyze, visualize, and export your Radar data soon. All customers can start using event filters today. Just visit the Events page and click the Filters button. Not a customer yet? Visit our home page to get started!